The ground floor rental unit and the owners’ residence each have dedicated entrances on the front porch. The entrance’s oiled cedar cladding gives the façade an added source of warmth. The basement rental unit is accessed through a separate door a few steps below the porch. On the triplex’s second floor, the homeowners’ living room is framed by a sizeable bay window. The room centers on an EQ3 couch and Blu Dot’s Free Range coffee table. A fireplace, finished with plaster, serves as a source of added warmth during the winter and a focal point all year round. The interiors were designed by Mason Studio. A spacious kitchen anchors the second floor. Its streamlined Cabico cabinetry and Gaggenau appliances direct the eye to the bay window and create an airy sensation. Quick meals can be eaten while perched atop the Cee stools at the Caeserstone countertop. Behind the living room, a minimalist staircase leads to the upper level’s bedroom and family room. White oak flooring unites the staircase and the rest of the living spaces. On the triplex’s uppermost floor, a family room looks out onto a cantilevered terrace. Its occupants congregate to watch television on the EQ3 Morton sofa and put their feet up on the Rustic Storage coffee table by West Elm. The triplex’s owners wanted their family area to have a studio-like quality. To that end, cabinetry by Cabico and a Restoration Hardware workstation can be used for work as well as leisure. Added warmth comes from a feature wall made up of Century Architexture bricks that replicate those found in Torontonian warehouses. The soothing master bathroom is a vision in white and grey. On the walls, Statale 9 tiles by Viva blend the aesthetics of concrete and rough-hewn wood. This textural element contrasts with the crispness of the angular sinks and tub from Neptune’s Wish Collection. The master bedroom, situated at the front of the third-floor addition, is bathed in light from full-height windows. A slightly smaller window illuminates a nook leading to its walk-in closet. 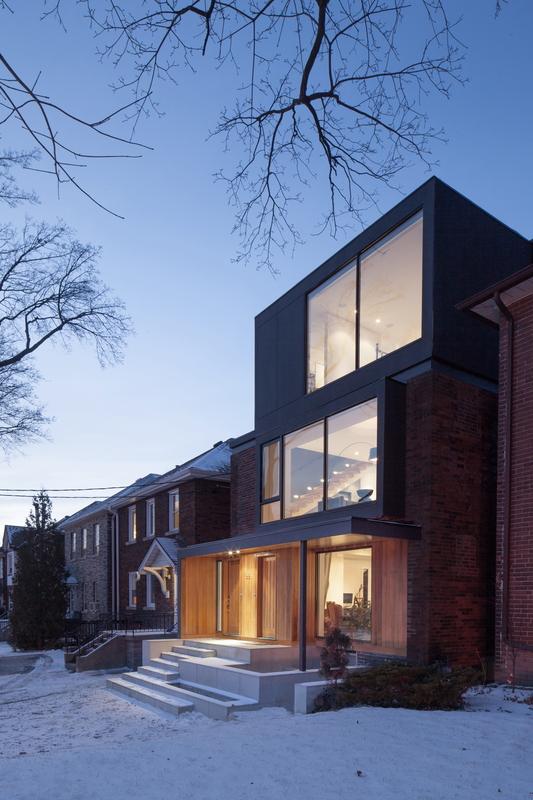 On a residential street in midtown Toronto, Studio JCI undertook the renovation of a two-story home, adding two generous rental units while preserving the street’s established character. The architects grafted a third floor onto the home, thereby satisfying the owners’ desire for high ceilings and providing them with ample living areas. The owners enjoy as much space as a traditional single-family home as well as two new sources of income. The renovation, then, is the best of both worlds: a spacious home that takes full advantage of rising urban density.